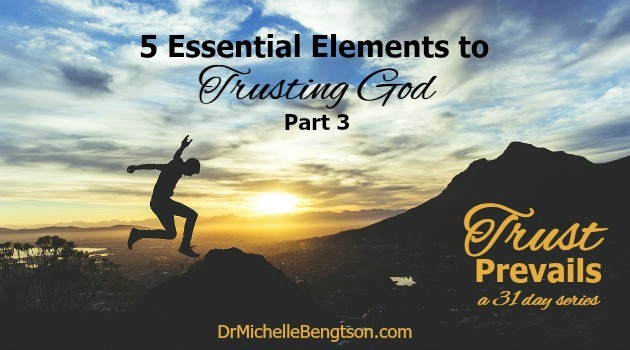 In our discussion of the essential elements for trusting God, we first discussed T-Take Him at His word and then yesterday discussed R – Rest in His Presence. We acknowledged the importance of believing that God doesn’t change His mind and can be trusted to do as He promises. We also acknowledged that by resting in His presence, we rest in the knowledge that God is in control, which alleviates our need to strive to make things happen. In walking with the Lord to learn how to more intentionally and deeply trust Him, the third essential element He highlighted to me was: U – Understand the Outcome Doesn’t Depend on Me. In trusting God, I must relinquish personal control while, in essence, telling God, “I believe your way is best – whatever that may be.” For me, that often means I have to give up control of understanding – even understanding or knowing what He is doing or what the outcome will be. In trusting God, I must relinquish control while telling God, I believe your way is best. My understanding of others, all situations, and myself is limited. Therefore, I cannot rely on my understanding, but I can be confident in God knowing all things – including the outcome of my situation. “Lean on, trust in, and be confident in the Lord with all your heart and mind and do not rely on your own insight or understanding” (Proverbs 3:5 AMP). As I trust God, I believe that even in the hard days, even in the challenges I face when I do not see the resolution, God can turn my messes into something good. “And we know that in all things God works for the good of those who love him, who have been called according to his purpose (Romans 8:28 NIV). What outcome do you need to leave up to God?